DoubleChorus is an enigmatic modulation effect adding as much depth and texture as you like. And it can get THICK. Super-extra-plus-plus chorusing via four modulated delay lines. Outstandingly thick and rich when fed with your favorite distortion pedal (or in your effects loop–hint, hint…) True-bypass. Pure, gentle light fluidly undulates and glistens as the complex aural syrup flows and morphs into a stunning harmonic nectar. Smooth, natural and comfy. This is the DoubleChorus. 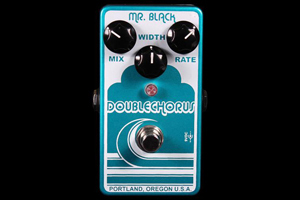 As with all Mr. Black pedals this unit is handmade in Portland Oregon and conceived by the mind of Mr. Jack Deville.